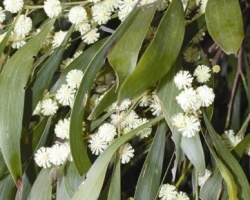 Native to Australia, this fast growing tree thrives in sand, salt wind and low water conditions. The gray green foliage is year round and works with mediterranean style planting choices. Bark is dark brown - almost black. Some suckering will occur if the roots/trunk have been disturbed or damaged. This tree needs good drainage and must have room for spreading roots. It is known to have aggressive roots that can lift sidewalks.A. 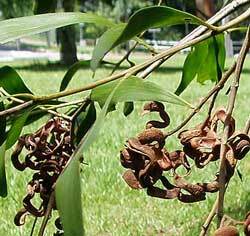 melanoxylon is not recommended as a street tree nor planted near power lines. Of interest, the wood is very dense and this tree is not as prone to limb shedding as other trees (like eucalyptus). The hard wood has been used for making furniture and industrial uses historically. It is longer lived than many of the other Acaia species. This acacia blooms during winter with fluffy pale yellow inflorescenses. The bloom has a sweet fragrance. Interesting mature seed pods and has been known to reseed freely in our area. The seeds are very hard and take years to germinate. There are many other varieties of acacia that are worth a closer look at for the Marina garden that are not as invasive or large at maturity. 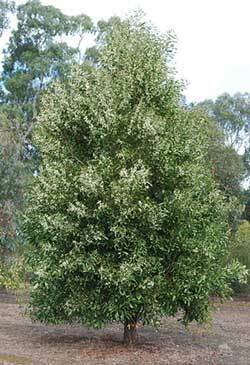 Willow Acacia is a smaller tree with beautiful foliage that can work in many challenging backyard situations. Other species of acacias grow from low spreading ground covers to tall trees with much of the same drought tolerance of the Blackwood. Sierra Azul may carry some low growing varieties worth considering that are hard to find elsewhere. *note asterisk denote species will be shaped by a prevailing wind. Single trunk trained trees need more protection than multitrunk to grow straight. ***note asterisk denote species grows fast and should not be planted under power lines.